U.S. military and intelligence agencies directed physicians in U.S. military detention centers to violate ethical principles and medical standards to avoid infliction of harm, according to a panel of physicians, ethicists, retired military personnel and other public health and legal experts. The Department of Defense and Central Intelligence Agency improperly demanded that U.S. military and intelligence agency health professionals collaborate in intelligence gathering and security practices in a way that inflicted severe harm on detainees in U.S. custody, alleged the Task Force on Preserving Medical Professionalism in National Security Detention Centers in a press release. These practices included “designing, participating in, and enabling torture and cruel, inhumane and degrading treatment” of detainees, according to the report. 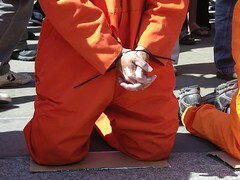 The group also said that the CIA’s Office of Medical Services played a critical role in reviewing and approving forms of torture, including waterboarding, as well as in advising the Department of Justice that “enhanced interrogation” methods, such as extended sleep deprivation and waterboarding that are recognized as forms of torture, were medically acceptable. CIA medical personnel were present during administration of waterboarding, says the Task Force. The Task force called on states and professional associations to discipline members who breached standards of professional conduct. ACP Internist addressed issues specific to physicians who care for enemy combatants and other detainees in conference coverage of Internal Medicine 2008. The ACP Advocate Blog addressed the history of ACP’s stance on the issue in a 2009 post.